Last week, the New York Times reported that a hamburger made from cow muscle grown in a lab was fried up and eaten in London. The hamburger was 2 years in the making and cost $325,000. Beef – tasty, but tough on the planet! The cost of the lab-grown meat is not the issue. A lab experiment to create a prototype, by definition, does not represent the costs involved when a product is commercialized and scaled. 3 of the main greenhouse gases that power climate change are carbon dioxide, methane, and nitrous oxide. Raising animals for food creates CO2 and is the single largest source of the other 2 gases – 37% of methane and 65% of nitrous oxide. the livestock industry drives deforestation, which destroys the trees and vegetation that absorb CO2. Animal agriculture take up 30% of the total land surface of the planet. Today, 70% of the Amazon rainforest is used for pastureland, and feed crops (for livestock) cover much of the rest. Beef is by far the biggest offender. Chicken is a better choice. Non-meat choices are the best in terms of lowering greenhouse gas emissions, reducing water use, and avoiding pollution. 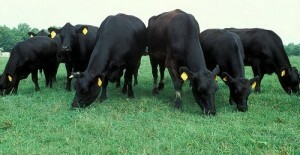 As population grows, meat consumption rises. We have crossed the 7 billion people threshold and are headed for 9 billion people by 2050 if current estimates hold. Rejiggering our eating habits and modifying the industrial agricultural practices that feed us now are essential to maintaining a habitable planet. swapping out even some meat helps. Beef, lamb, cheese, pork and farmed salmon are the worst offenders. Chicken, tuna and eggs are better choices. grains, vegetables, legumes and fruits are vastly more sustainable choices. adopting “Meatless Monday” (or any other day of the week) is a great idea. eating less meat is usually a plus for your health, as well as the planet. It’s a process – not an overnight change. And everyone has to eat – so choose wisely! While the tasters of the lab-grown burger describe it as “a little dry”, I salute this whole effort. It demonstrates the kind of innovation needed to take our food supply in a more sustainable direction.